Paricipants in the Columbia Seminary D.Min. 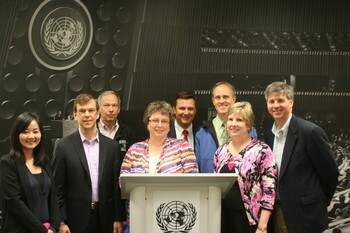 class at the Presbyterian Ministry at the U.N. (left to right): Meiying Shi, John Odom, Bob Freymeyer, Kerri Hefner, David Schaefers, Professor Mark Douglas, Barbara Johnson and Peter Bynum. —Courtesy of Presbyterian Ministry at the U.N.he Presbyterian Ministry at the United Nations and Columbia Theological Seminary have built a tradition that blends two valued Presbyterian hallmarks — public policy involvement and well-educated clergy. This May marked the seventh time a Doctor of Ministry class from the Presbyterian seminary in Decatur, Ga., spent two weeks at the U.N. Ministry in New York. Each class studies a different global issue from a faith perspective. This year’s topic was one of the hottest international issues in the church, the Israeli-Palestinian conflict. “The timeliness of the class right before the General Assembly was very important,” said David Schaefers, one of the students. “There were folks in my congregation who had questions about overtures (on the Middle East) before G.A,” said Schaefers, pastor of First Presbyterian Church of Richardson, Texas. Before attending the class he had a “general idea” about the issues and the PC(USA)’s polices in the region, but now he says he can engage his congregation’s questions with much greater understanding. Speakers from the Israeli and Palestinian missions to the U.N. addressed the class as did representatives from U.N. programs and non-governmental organizations working in the region. Staff members from the U.N. Ministry and other Presbyterian Mission Agency programs briefed the class on relevant Presbyterian Church (U.S.A.) policies, partnerships, and programs. Auburn Theological Seminary staff served as speakers and made connections for the class in the New York area. Another student, Kerri Hefner, was pleased to learn that religious bodies and non-governmental organizations are able to participate in U.N. working groups and other important conversations at the U.N. Headquarters. “To see that the faith perspective is welcome was meaningful and really surprising,” said Hefner, pastor of New Hope Presbyterian Church in Chapel Hill, N.C.
Hefner was impressed with the U.N. Ministry’s efforts to serve Presbyterians, particularly the research the staff does for Presbyterians writing General Assembly overtures on international issues. In addition to the D.Min. class, an average of 15 other Presbyterian groups visit the U.N. Ministry each year for seminars, said Mark Koenig, director of the U.N. Ministry. “The seminars help equip the church for global discipleship, and they build understanding and what it means to engage a public policy issue in the name of Jesus,” Koenig said. Christian ethics professor Mark Douglas, who led the D.Min. class, said the PC(USA)’s U.N. Ministry and its Office of Public Witness in Washington, D.C., help the denomination stay true to the Reformed view of how God works in the world. Pat Cole is communications associate for Funds Development Ministries of the Presbyterian Mission Agency and a frequent contributor to Presbyterian News Service.